Knowledge of the fetal antecedents of cardiovascular disease has increased rapidly since the association between low birth weight and the disease was demonstrated 20 yr ago. It now is known that individuals who had low birth weight or who were thin or short at birth are at increased risk for both cardiovascular disease and type 2 diabetes. This has been shown in studies in different countries and cannot be explained by confounding variables. Through clinical and animal studies, the biologic processes that underlie the epidemiologic associations and how their effects are modified by postnatal growth and by living conditions in childhood and adult life are beginning to be understood. One such process is altered renal development, with reduced nephron numbers, which may initiate hypertension. A consistent and largely unexplained feature of so-called “Western” diseases, which include coronary heart disease and type 2 diabetes, is that within a country, their rates tend to be highest among poorer people in less affluent places. This is a paradox as the modern epidemics of these diseases have accompanied rising prosperity. Within Britain, the highest rates of coronary heart disease occur in historically poor industrial towns in the north that grew out of the industrial revolution and in rural areas with low-grade soil. A series of studies carried out in the 1960s and 1970s failed to identify any characteristic of these places that might explain their high disease rates (1). The lifestyles of poorer men and women were similar to those of people elsewhere, and the only identifiable biologic differences seemed to be a tendency toward shorter stature and slightly higher BP. A number of strands of evidence suggested that coronary heart disease might be linked to adverse influences in childhood. In 1964, Rose (2) reported that patients with coronary heart disease had had twice as many siblings who were stillborn or died in infancy as compared with control subjects. He concluded that “ischemic heart disease tends to occur in individuals who come from a constitutionally weaker stock,” a conclusion foreshadowing what is considered the case today. The finding that mortality from coronary heart disease correlated with past infant mortality in the 20 counties of Norway led to the suggestion that a poor standard of living in childhood and adolescence was a risk factor for heart disease (3). More recent studies in Finland do not support this contention (4), in that they suggest that living conditions in childhood and must be sufficiently good to permit the rapid compensatory gain in body mass index (BMI; weight/height2) that generally precedes the development of coronary heart disease. The first evidence that events during fetal life might be important appeared 20 yr ago. Experiments in animals had previously demonstrated that the fetus is plastic during development and that its structures and functions can be permanently changed by undernutrition (5–8), observations that laid the foundations of the programming hypothesis. Detailed analysis of a million deaths that occurred from coronary heart disease across England and Wales during 1968 to 1978 showed that the geographic distribution closely resembled the distribution of infant deaths around the time that the generation that is now dying of coronary heart disease had been born (9), in an era in which more than one in 10 infants in northern industrial towns died before reaching the age of 1 yr. Those among that same generation, now 50 yr or older, had death rates from coronary heart disease 20% above the national average. In comparison, in the affluent rural south and east areas of England, only one in 20 infants had died and coronary heart disease rates were 20% below the national average. When infant deaths in the first month after birth were distinguished from deaths between 1 mo and 1 yr, it was the former group that had the closest relation to coronary heart disease; most of these deaths occurred in the first few days after birth and were attributed to low birth weight. This association between low birth weight and coronary heart disease in the same generation was subsequently demonstrated in individuals, which required a new approach. It was necessary to identify groups of men and women, now in middle to late life, whose size at birth had been recorded and, therefore, could be related to the later events such as coronary heart disease and other disorders. In Hertfordshire, UK, from 1911 onward, infants were delivered by a midwife, who recorded the birth weight (10). A health visitor made home visits throughout infancy, and each infant’s weight at 1 yr was recorded. Table 1 shows the findings in 10,636 men who were born during 1911 to 1930. Hazard ratios for coronary heart disease fell with increasing birth weight. There were even stronger trends with weight at 1 yr. An association between low birth weight and coronary heart disease now has been replicated in many studies in both men and women in Europe, the United States, and India (4,11–15). Low birth weight has also been associated with a risk for developing type 2 diabetes in studies from many parts of the world (16–20). These associations do not seem to depend on the length of gestation. As mothers with diabetes in pregnancy tend to have large infants, one might expect some large infants to have evidence of impaired glucose metabolism. Among the Pima Indians in the American southwest, in whom diabetes in pregnancy is unusually common, young men and women who had birth weights >9.9 lb had an increased prevalence of non-insulin-dependent diabetes (17). The association between birth weight and non-insulin-dependent diabetes was U-shaped in the Pimas, whereas the increased risk for diabetes among infants with high birth weights was associated with gestational diabetes. These observations suggest that influences that are linked to growth in utero and during infancy have an important effect on the subsequent risk for cardiovascular disease and type 2 diabetes. It has been argued, however, that people whose growth was impaired in utero and during infancy may continue to be exposed to an adverse environment in childhood and adult life and that it is this later environment that accounts solely for the effects attributed to intrauterine influences (21–24). However, there now is strong evidence that this argument cannot be sustained (11,12,14). Many data indicate that associations between low birth weight and later disease are independent of influences such as smoking habits, employment, alcohol consumption, and exercise. Adult lifestyle, however, clearly adds to the effects of early life (11,16,25); for example, studies in Finland demonstrated that the highest incidence of coronary heart disease occurs among men who were thin at birth and also had low household incomes as adults (26). A number of other concerns that slowed the acceptance of the fetal origins hypothesis have been raised. The associations between birth weight and later disease are graded, extending across the whole range of birth weight, not just confined to neonates with pathologically low birth weight. This observation suggests that what were formerly regarded as normal variations in the supply of nutrients to the fetus have important effects for the health of the next generation. Underlying this finding is the concept that the increased risks for those who are born with a relatively low birth weight are not the long-term consequences of reduced total body size but rather the effects of reduced allocation of resources on the development of key systems such as the vasculature and organs such as the kidney. Another difficulty is that maternal nutrition has been viewed too narrowly as the diet that a mother eats during pregnancy. A mother’s ability to nourish her fetus also depends on her body nutrient stores, her metabolic capacity, and indeed her lifelong nutritional experience (27). Fetal nutrition cannot be considered equivalent to maternal nutrition, as it depends also both on the mother’s physiologic and metabolic responses to pregnancy and on placental function (28). Until recently, it was assumed that, because the embryo is small, its nutritional requirements can be readily met. It now is clear from observations on humans and animals that the embryo is sensitive to the nutrients that it receives and may be permanently changed by them (28). The biologic basis for these associations with birth weight seems to rest in the phenomenon termed developmental plasticity. The organs and systems of the body pass through critical developmental periods when they are plastic and sensitive to the environment. For most organs, including the kidney, the sensitive period occurs in utero. Developmental plasticity enables the production of phenotypes that are better matched to their environment than would be possible if the same phenotype were produced in all environments (29,30). The fetus of a poorly nourished mother responds by adaptations, such as reduced body size and altered metabolism, which help it survive. Until recently, we have overlooked a growing body of evidence that body systems that are closely related to adult disease, such as the cardiovascular system and the kidneys, which regulate BP, are also plastic during early development. In animals, it is surprisingly easy to produce changes in the BP and metabolism of offspring by modifications to the diet of the mother before and during pregnancy (8,31,32). Fetal malnutrition induced by either maternal protein restriction or uteroplacental insufficiency leads to a lifelong predisposition to hypertension in animal models (33–36). The different sizes of newborn human infants exemplify the concept of plasticity. The growth of the fetus is constrained, of necessity, by the size of the mother; otherwise, normal birth could not occur. Small women have small infants: In pregnancies after ovum donation, they have small infants even when the woman who donates the egg is large (37). Newborns may be small for dates because their growth is maternally constrained or because they do not receive the nutrients for growth. As McCance (5) wrote, “The size attained in utero depends on the services which the mother is able to supply. These are mainly food and accommodation.” Because a mother’s height or bony pelvic dimensions are generally not important predictors of the infant’s long-term health, research into the developmental origins of disease has accordingly focused on the nutrient supply to the infant, although it is recognized that other factors, such as hypoxia and stress, also influence fetal growth. That fetal nutrition is important is supported by the persisting effects of different nutritional regimens in premature infants (38,39). Size at birth in relation to gestational age is a marker of fetal nutrition around the world (28). In developing countries, many neonates show the effects of chronic malnutrition in their mothers. Despite current more-than-adequate calorie intake in Western countries, the nutrition of many fetuses and infants remains suboptimal, either because they receive unbalanced macronutrients or do not receive essential micronutrients or because the mother’s body composition—which also nourishes the fetus and the infant—is suboptimal (32). The developmental (or fetal) origins hypothesis proposes that coronary heart disease, type 2 diabetes, stroke, and hypertension originate through developmental plasticity, in response to undernutrition during fetal life and infancy (40,41). Why should fetal responses to undernutrition lead to disease in later life? A general answer would seem clear, according to the “life history theory,” by which increased allocation of energy to favor the development of one process, such as brain growth, necessarily reduces allocation to one or more other processes, such as tissue repair. Smaller infants, who have received less energy in utero, must incur higher costs, and these may result in changes that lead to disease in later life. A more specific explanation as to why people who were small at birth may be vulnerable to later disease may be approached by considering three processes—organ endowment, thrifty phenotype, and later environmental influences—which are explained in turn. First, someone whose fetal growth was restricted will have fewer cells or functional units in key organs such as the kidney. This phenomenon may be part of a general reduction or may be selective: Undernourished fetuses may divert blood flow away from one organ to protect another (42). Brenner et al. (43) postulated that high BP is initiated by the reduced number of nephrons in the kidneys of people who were small at birth. There now is a body of evidence that the kidney plays an important role in programming hypertension. Animal models in which fetal growth is constrained often lead to reduction in glomerular numbers (34–37). In humans, fetal growth restriction has been observed to be associated with reduced nephron numbers (44), reduced renal volume (45), and fewer glomeruli with increased glomerular volume (46). A reduced nephron number, if not accompanied by proportional reduction in excretory load, leads to glomerular hyperfiltration, with associated intraglomerular hypertension that may lead to the development of glomerulosclerosis over time. According to this theory, as the loss of glomeruli that accompanies normal aging occurs in people who were born with a relatively low number of nephrons, accelerated glomerular loss occurs, along with a self-perpetuating cycle of rising BP (43). Direct evidence in support of the link between fewer nephrons and hypertension in humans has come from a small study of the kidneys of people who were killed in road accidents; those who were being treated for hypertension had fewer but larger glomeruli as compared with those without hypertension (47). Another process by which slow fetal growth may be linked to later disease relates to hormones and metabolism. An undernourished fetus may establish a “thrifty” way of handling energy intake—food (25). Tissue resistance to the effects of insulin, which underlies type 2 diabetes and is associated with low birth weight, may be viewed as persistence of a fetal response by which glucose concentrations are maintained in the blood for the benefit of the brain but at the expense of glucose transport into the muscles and muscle growth (48). However, insulin resistance in postnatal life is injurious over time. A third link between low birth weight and later disease stems from the concept that people who were small at birth may be more vulnerable to adverse environmental influences in their later life. Observations in animals models indicate that the environment during development can permanently change not only the body’s structure and function but also its responses to environmental influences encountered in later life (30). Table 2 presents hazard ratios derived from examining the effect of low income in adult life on coronary heart disease among men in Helsinki (26). As expected from the known association between coronary artery disease and low socioeconomic status, men who had a low taxable income had higher disease rates, yet this association was confined to those who had had slow fetal growth and were thin at birth, as defined by a ponderal index (birth weight/length3) of <26 kg/m3. Men who were not thin at birth were resistant to the effects of low income on coronary heart disease. One explanation of these findings emphasizes the psychosocial consequences of a low position in the social hierarchy, as indicated by low income and social class, and suggests that perceptions of low social status and lack of success lead to changes in neuroendocrine pathways and hence to disease (49). The findings in the Helsinki cohort seem consistent with this theory. People who are small at birth are known to have persisting alterations in responses to stress, such as raised serum cortisol concentrations (50). It has been suggested that small elevations of cortisol concentrations that persist over many years may have effects equivalent to those produced far more quickly by glucocorticoid-secreting tumors, which result in relatively sudden, large increases in glucocorticoid concentrations. People with Cushing’s syndrome are insulin resistant, have raised BP, and shift fat stores from peripheral to central sites (51); all of these abnormalities predispose to coronary heart disease. 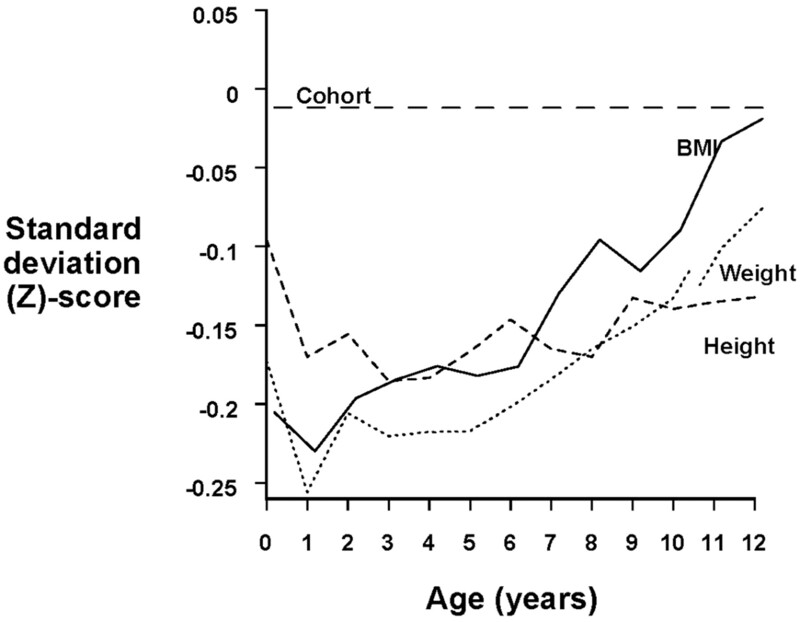 Standardized mean scores (z scores) for height, weight, and body mass index during childhood in 357 boys who later developed coronary heart disease within a cohort of 4630 boys. At any age, the mean z score for the cohort is set at 0, whereas the SD is set at 1. The occurrence of high BP and type 2 diabetes is associated with the same general pattern of childhood growth as coronary heart disease. In both genders, risk for disease falls with increasing birth weight and rises with rapid weight gain in early childhood (16,17,19,20,54,55). Table 3 depicts hazard ratios for hypertension, defined as high BP requiring treatment, according to birth weight and quartiles of BMI at age 11 yr among men and women who were born in Helsinki during 1924 to 1944 (41). At any birth weight, hazard ratios tend to be highest in people who had a high childhood BMI. Conversely, at any childhood body mass, the hazard ratios are highest among those who had low birth weight. There now is a substantial literature indicating that birth weight is associated with differences in BP within the normal range (56,57). These differences are found in children and young adults but tend to be small. A 1-kg difference in birth weight is associated with an approximately 3-mmHg difference in systolic pressure. The contrast between this small effect and the large effect on later prevalence of hypertension (Table 3) may reflect amplification of the low birth weight effect with aging. In the Nurses Study cohort in the United States, in which women were studied sequentially at 15-yr intervals, the impact of low birth weight on the prevalence of hypertension increased with age (57). Hence, small BP differences that are detected in children and young adults may progress to larger differences as vulnerable individuals age. Effective counterregulatory mechanisms in youth may maintain near-normal BP levels for many years after birth, whereas loss of vasodilatory and antioxidant pathways with normal aging may eventually lead to progressive hypertension. A cycle of rising BP, further glomerular destruction, and further rise in BP may be initiated (58). Evidence to support the development of self-perpetuating cycles comes from a study of elderly people in Helsinki among whom the effect of birth weight on BP was confined to those who were being treated for high BP (59). Despite their antihypertensive treatment, the BP of those who had had low birth weight were markedly higher. There was a >20-mmHg difference in systolic BP between those who weighed 2500g (5.5 lb) or less at birth and those who weighed 4000 g (8.8 lb) or more. Among the normotensive individuals, birth weight was unrelated to BP. An inference is that by the time they reached old age, most of the people with lesions that were acquired in utero had developed clinical hypertension and that their elevated BP was difficult to control. A US study of 3236 Medicaid beneficiaries who were being treated for hypertension also suggested that hypertension is more difficult to control among patients who had low birth weight (60). When undernutrition during early development is followed by improved postnatal nutrition, many animals manifest accelerated or “compensatory” growth. This same phenomenon is seen in plants. Compensatory growth has costs, however, which, in animals, include reduced lifespan (61). There are a number of processes by which, in humans, undernutrition and small size at birth followed by rapid childhood weight gain could lead to cardiovascular disease and type 2 diabetes in later life (4,41,54). Rapid weight gain may lead to an unfavorable body composition. For example, infants who are small and thin at birth lack muscle, a deficiency that will persist as the critical period for muscle growth occurs in utero, and there is little cell replication in muscle after birth (6). If they develop a high body mass during later childhood, then they may have a disproportionately high fat mass in relation to lean body mass, which will lead to insulin resistance (62). In this and other ways, the epidemic of childhood overweight and obesity in Western countries may be amplifying the effects of poor fetal and infant growth. Rapid childhood weight gain may also increase risk for renal injury. High body mass is associated with increased excretory load, which induces hyperfiltration and creates intraglomerular changes that mimic those of reduced nephron numbers. After restriction of fetal growth, expansion of body mass beyond the birth weight centile may amplify the effects of reduced nephron number, further enhancing excretory load and glomerular hyperfiltration (63). Recent studies, especially those in Helsinki, a city in which there is exceptionally detailed information on child growth and socioeconomic circumstances, increasingly indicate that the pathogenesis of cardiovascular disease and related disorders depends on a series of interactions that occur at different stages of development. To begin with, the effects of the genes acquired at conception may be conditioned by early intrauterine environment (64,65). For example, the Pro12Pro polymorphism of the peroxisome proliferators-activated receptor gamma 2 gene has been associated with insulin resistance (65). In a study of 476 elderly people in Helsinki, however, this association was seen only among men and women who had low birth weight. Such interactions between the effects of genetic polymorphisms and those of birth weight, a marker of fetal nutrition (28), would be predicted if chronic disease originates through developmental plasticity (29,30). The effects of the intrauterine environment on later disease are conditioned not only by events at conception and before birth but also by events after birth. Table 3 notes how the effects of intrauterine environment are further influenced by childhood weight gain. Table 2 shows how these effects are conditioned by living conditions in adult life. Table 4 shows how the effects of low birth weight on later hypertension are conditioned by living conditions in childhood, as indicated by the occupational status of the father (66). Among all of the men and women in the Helsinki study, low birth weight was associated with an increased incidence of hypertension, as anticipated from previous findings (55). This association, however, was present only among those who were born into families in which the father was a laborer or in the lower middle class. It seems that the pathogenesis of cardiovascular disease and type 2 diabetes cannot be understood using a model in which risks that re associated with adverse influences at different stages of life are simply additive. Rather, disease is the product of branching paths of development triggered by the environment. The pathways then determine the vulnerability of each individual to what lies ahead. The pathway to coronary heart disease and type 2 diabetes may originate either with slow fetal growth as a consequence of undernutrition or with poor infant growth as a consequence of poor living conditions (18). Thereafter, the pathway is determined by rates of weight gain in childhood, by socioeconomic conditions, and, presumably, by other influences as yet undiscovered. The effects of slow fetal growth and low birth weight and the effects of postnatal development depend on environmental influences and paths of development that precede and follow them. Low birth weight or any other single influence does not have “an” effect that is best estimated by a pooled estimate from all published studies. As Dubos (67) wrote, “The effects of the physical and social environments cannot be understood without knowledge of individual history.” Unraveling the pathogenesis of chronic disease and, hence, how to prevent it will require an understanding of heterogeneity. Low birth weight, although a convenient marker in epidemiologic studies, constitutes an inadequate description of the phenotypic characteristics of an infant that determine its long-term health. In infants, as in children, growth retardation is a response to a poor environment, especially undernutrition. However, body weight at birth does not adequately describe the long-term morphologic and physiologic consequences of undernutrition. The same birth weight can be attained by many different paths of fetal growth, and each is likely to be accompanied by different gene-environment interactions (28). Nevertheless, birth weight provides a basis for estimating the magnitude of the effects of the fetal phase of development on later disease, although it is likely to underestimate them. Because the risk for cardiovascular disease is influenced both by small body size at birth and during infancy and by rapid weight gain in childhood, estimation of the risk for disease that is attributable to early development requires data on fetal, infant, and childhood growth. Currently, the Helsinki studies are the most complete source of information (41). On the basis of the findings in the Helsinki cohort, one can estimate the improvement in health if all individuals had been in the most favorable tertile of body size at birth and had not had accelerated weight gain in childhood. Thus, if each man in the cohort had been in the highest third of ponderal index at birth, and each woman had been in the highest third of birth length, and each man and woman had lowered their SD score for BMI between age 3 and 11 yr, then the incidence of coronary heart disease would have been reduced by 40% in men and 63% in women (41). Improvement in fetal nutrition and maintenance of optimal trajectories of childhood weight gain may be powerful strategies for the prevention of chronic disease in later life. Childhood Exposures to Ozone: The Fast Track to Cardiovascular Disease? Response to Letter Regarding Article, "Evidence of Arteriolar Narrowing in Low-Birth-Weight Children"
Endothelial Dysfunction: A Link Among Preeclampsia, Recurrent Pregnancy Loss, and Future Cardiovascular Events?